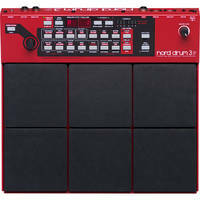 In this Quick Listen, you will hear multiple synthesis types used to create a range of timbres from the Nord Drum 3P Modeling Percussion Synthesizer, which allows you to trigger drum sounds via six on-board drum pads and one external trigger input. This module features six channels, each with drive, ring-mod, sample-rate reduction, and EQ, as well as stereo reverb and stereo delay on a macro scale. Learn more via video at BandH.com.